Killer Characters: Where is everybody? Submitted by Jordan Kelly Bingham from Victoria Abbott's The Wolfe Widow: the third book collector mystery. Of course, Jordan's in the first two books as well. Someone's got to sleuth! Eeep. I’m in trouble and I mean big trouble. And I’m unable to help my former employer when it is obvious—to me if not to her—that her life is in danger from a new and ominous visitor to Van Alst House. Muriel Delgado is a menacing vision in black swirling garments. First she takes over the house and next thing you know, I’ve been fired! My uncles, Mick and Lucky, seem to have some kind of ‘project’ on the go. The less I know about that the better, if you get my meaning. My friends Tiff and Lance have disappeared without a word. My possible love interest (as they say), Officer Tyler “Smiley” Dekker is out of town on a ‘course’. No one at the police station knows anything about that. No one answers my calls and texts even after I’ve been hit by a truck. Really, people? Really? Looks like I’m on my own. Except for Signora Panetone and Uncle Kev and you know they’re … I’m at a loss for words here … but shall we say, they’re not the most help. Never mind, I still have Walter the Pug and Cobain, Smiley’s dog. I seem to be looking after them. They're always willing if there's a treat involved. But I’m starting to worry. Will I have to bend my own rule about being the first person in my family to go straight? I may need to do a little illegal night time snooping. I may have to use those lockpicks I got for my Sweet Sixteen to liberate some information. But at the very least, can I count on you to keep my little secret? I'm really hoping that Vera and I make it to the end of The Wolfe Widow. Please answer my texts! 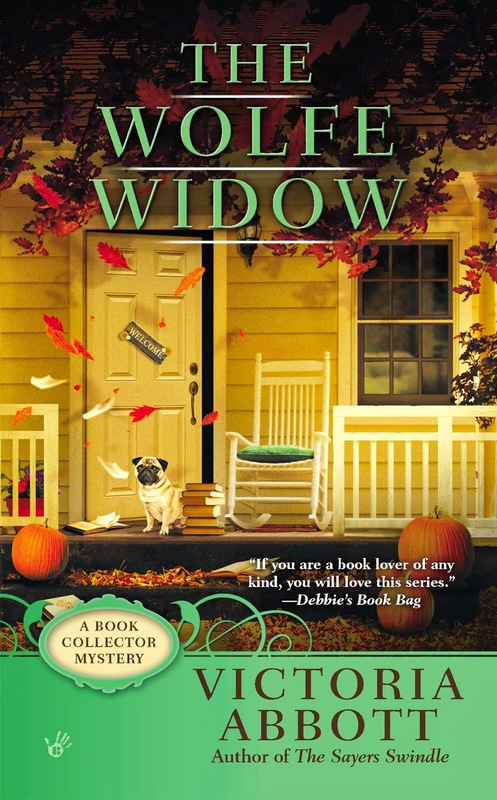 The Wolfe Widow is out September 2, 2014. You can preorder it here! I loved the Christie Curse and just got Sayer's Swindle and now there's another story to look forward to. I love Jordan and her uncles. I'm sure their back story could fill its own book. The Wolfe Widow sounds awesome. I might have to jump right to that book but I'll try to pace myself and read Sayer's next. Thanks for a very entertaining series. Ah, the plot thickens! Love it. Hang in there, Jordan! Jordan says thanks, Libby. If she shows up at midnight, please open the door! Gladly. And she can seek solace with our cats.